The Warrior 2000 Infantry Fighting Vehicle was developed by the former GKN Defence during its acquisition (1998/99) by the former Alvis PLC, which is now part of BAE Land Systems. 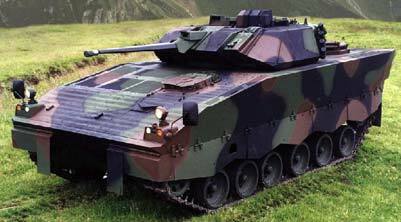 The vehicle was entered in to the Swiss Army Schutzenpanzer 2000 program to equip their army with a new Infantry Fighting Vehicle. The Swedish CV90 eventually won the program and 186 CV9030 under the designation CV9030CH are now in service. The Warrior 2000 had an improved turret supplied by Delco Defence Systems, housing a stabilized 30mm Bushmaster chain gun, allowing the vehicle to fire on the move. The vehicle was fitted with additional ballistic armour and a Perkins Condor 650hp V8 diesel engine. Though vehicle has a number of improvements over the British Army Warrior, it is no longer marketed or been exported.